Do not trade before you have a proven edge: Even before writing your trading plan you need to be sure that the system you are looking at has an edge. There is no reason to trade a system that loses money over time. The system has to have a positive outcome over X amount of time. Backtest it either by automatic (programming) or manually but remember to be critical and take every signal in your backtest. You are only fooling yourself if you do not do it correctly. It is not enough just to plot Stochastic on your chart and then believe you can make money. Do not even consider trading (either real money or paper money) before you have written your trading plan: You must have a plan in order to execute trades properly and this is definitely more true in trading than in most other fields. Despite the incredible importance of this task, most beginners have not even heard of a trading plan. This is the single biggest reason why so many new traders fail. Make a trading plan describing the signals you are allowed to take, when to take them and with how big a position. Stops, targets and money management all need to be written in detail. Rome wasn't built in one day: Trading is not a "get rich quick scheme" so it is important to enter this new career with realistic goals. Do not expect to be consistently profitable during the first 2 years. Some people are but most new traders need years to be consistently profitable. It is also equally as important not to expect to become a millionaire with a $5,000 account! Lower your expectations and set realistic goals. Learn from your mistakes as well as your profitable trades: An important thing new traders seem to forget or ignore is keeping a journal of your trades. Since they no longer have a boss asking for updates and reports they seem to think that keeping a journal is no longer important. This could not be further from the truth as keeping a journal helps with discipline and keeps you focused on the big picture and profitability. A great way to learn from your mistake is by going over your trades every weekend or end of the month. Sometimes you need fresh eyes to see what went wrong and that you cannot do just after the trade as you might still be emotional over the loss. Education, Education, Education: For some reason most traders believe that can trade and make money just by opening a brokerage account. A Doctor cannot perform surgery without studying it first just because that person gets a scalpel handed to him and learning about the Stock Market is no different. Read books and articles, look at charts for hours a day, take seminars or find a mentor. Learn about the indicators, ADX, Bollinger Bands, RSI but also learn about money management and trading psychology. Education is often overlooked but it is essential for a new trader to learn to trade. Trade minimum position size: There is no reason to trade more than the minimum position size. In the beginning of your trading career it is about consistency and not about making a living on trading. After becoming consistently profitable you can then add to your position size and thereby make a living on trading. Making a lot of profit in 1 trade does not make you are profitable trader so use minimum position size until you are making money consistently. There is only one reason why you would not be trading the minimum position size and that is when you are trading futures, like the NQ or ES. If your system is using scaling in or out then the minimum position size of 1 contract is making your system impossible to follow but there is a solution to that. Use the ETF, such as QQQQ or SPY. This way you are still only trading small position but still being able to scale in and out. Do not worry about the BIG $$$ until you are making the small $$$. You can always add to size later in your trading career. Do not trade for real money until you are profitable: If you're not profitable then there is absolutely no reason for you to trade real money instead of using a trading simulator. I am well aware that trading a simulator is not the same as trading real money but ask yourself this. 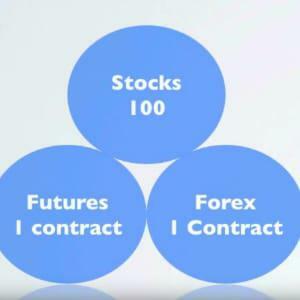 "If I am not profitable trading simulator then how can I expect to be profitable trading real money?" Do not come away from trading the simulator until you are consistently profitable but remember moving from simulator to real money is not an easy step because of the emotions in trading for real money. Trading is a business so cost is important: Cost is just as important in trading as in a normal business. It is important to keep costs low, but not so low that you do not have the right tools. The right "charting package" is important and so is the broker but sometimes you can still save money by being smart. Some brokers are cheaper than others and some of these might even be better suited for your trading style. Look around to see if you can get the same or better service but at a lower cost. Always use stops: Learning to trade successfully takes times so it is important that new traders manage to stay in the game long enough to learn trading. Stops help a trader to stay in the game. Never risk too much on any single trade and always use stops. Some traders do not want to accept that the trade has two outcomes: win or lose. They therefore refuse to use stops. Limit your loss, use stops!